I WAS VERY PROUD TO HAVE BEEN PART OF SPOTIFY’S FIRST EVER SONGWRITER CAMP AT THE 2016 EDITION OF AMSTERDAM DANCE EVENT. THE SONGWRITER CAMP AIMED AT GIVING SONGWRITERS ACCESS TO FACILITIES, EQUIPMENT AND INSPIRATIONAL COLLABORATORS, IN ORDER TO CREATE GREAT MUSIC AND HELP BUILD THEIR CAREERS. THE THREE DAY SONGWRITER CAMP WAS HELD AT STUDIO DE KEUKEN IN PARTNERSHIP WITH 15 INTERNATIONAL MUSIC PUBLISHERS. 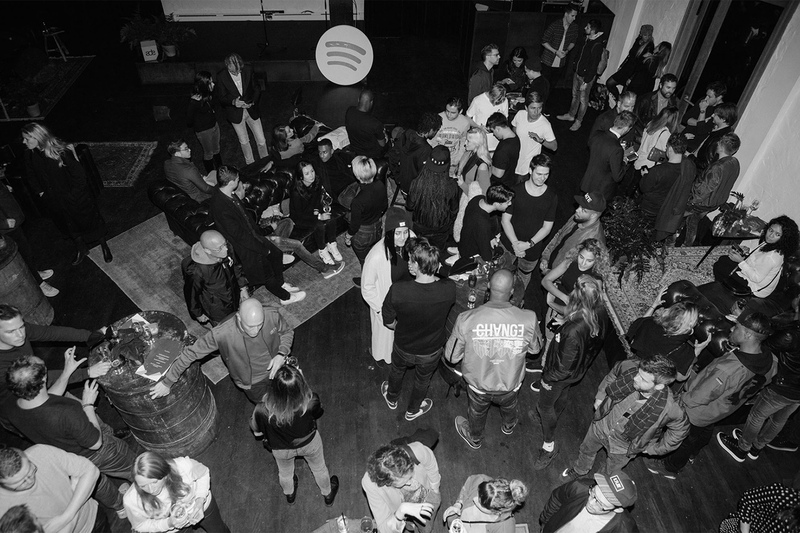 THE WRITER CAMP HOSTED MORE THAN 30 WRITERS, PRODUCERS AND ARTISTS, WORKING ON LIVE BRIEFS SOURCED FROM ARTISTS AND LABELS TIED TO SPOTIFY’S PLAYLIST FAMILY. THE RESULTS WERE UNVEILED AT THE END OF THE CAMP DURING THE FINAL LISTENING PARTY. I WAS ASKED TO COME UP WITH THE INTERIOR DESIGN OF THE SONGWRITING CAMP AND CREATED AN ENVIRONMENT THAT EMBODIED THE ATTRIBUTES OF SPOTIFY’S BUSINESS. TURNING STUDIO DE KEUKEN INTO A SPOTIFY BRAND EXPERIENCE AND CREATING THE INTERIOR DESIGN CONCEPT INCLUDING SIGNAGE AND MERCHANDISE FOR THE EVENT.